The latest Green Left Weekly carries an interesting article on the roots of the crisis in East Timor. It pushes the same line as the Communist Party of Australia-Howard wants to oust Marxist Prime Minister, Mari Alkatiri and replace him with someone more compliant. Timor's oil reserves are the real reason for Australian intervention. "While claiming to be “neutral” on the dispute between the economic nationalist Alkatiri and Xanana and other elite politicians, the Australian government has been quick to condemn Alkatiri’s leadership, declaring East Timor a “failed state”. After the arrival of 2200 troops from Australia, New Zealand and Malaysia in late May, a concerted campaign began in the Australian corporate media to demonise Alkatiri, while presenting his rivals — Gusmao and recently promoted defence minister Jose Ramos Horta — as “responsible leaders”. On June 1, the Australian’s Greg Sheridan asserted that “Alkatiri has been the author of every calamitous decision the East Timorese Government has made”. Sheridan called for Alkatiri’s resignation on June 3, claiming, “If [the Australian government] cannot translate the leverage of 1300 troops, 50 policemen, hundreds of support personnel, buckets of aid and a critical international rescue mission into enough influence to get rid of a disastrous Marxist Prime Minister, then [it is] just not very skilled in the arts of influence, tutelage, sponsorship and, ultimately, promoting the national interest”. Sheridan’s defence of Australia’s “national interest” was not a call for peaceful relations with the people of East Timor, but a blatant bid to strengthen an Australian corporate monopoly over US$30 billion worth of oil and gas in the Timor Sea." New Zeal With the Australian Communist Party and their equally Marxist mates, the Democratic Socialist Perspective both pushing the "invasion for oil", let's see how long it is until the MSM join the chorus? I don't think the mainstream media will start pushing this message. 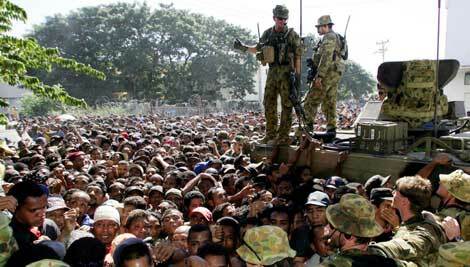 In our media we have seen a demonisation of Timor's now former PM but there has been little demonising the rebels. There was a good piece by John Martinkus in the NZ Herald the other day. He knows his East Timor stuff pretty well.